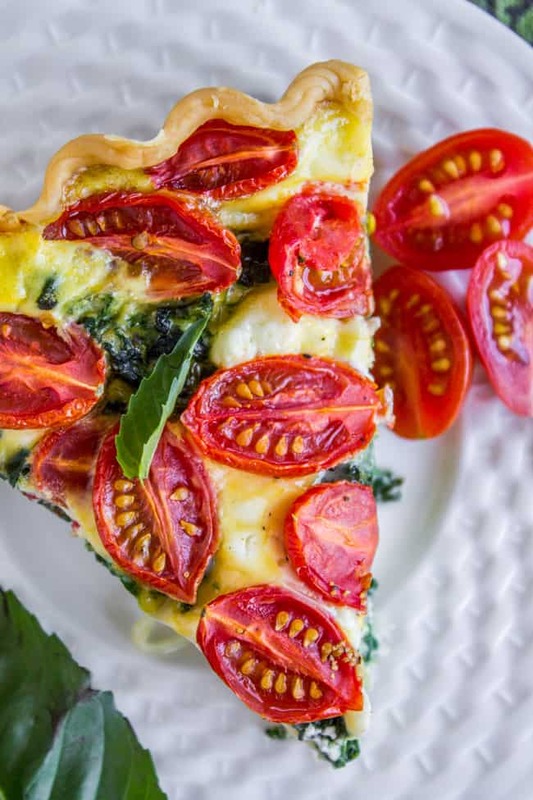 This quiche is perfect for spring! 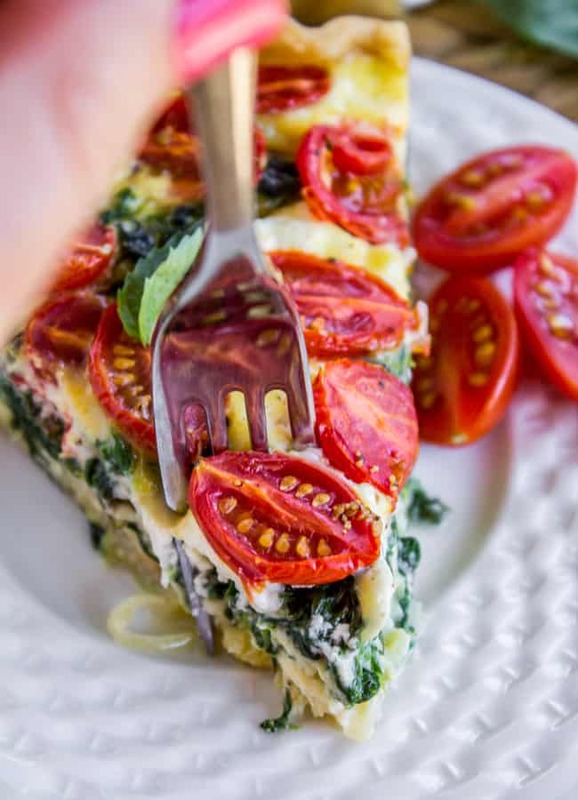 A vegetarian recipe that combines cherry tomatoes, leeks, spinach and goat cheese to make a hearty breakfast, brunch, or dinner. It was quite a revelation to all of us. What if our noses really DO smell like boogers? We would never know. Do you love quiche as much as I do? I don’t know why I don’t make them more often. There is just something magical about eating pie crust for breakfast. Especially when that flaky crust is filled with eggs, basil, yummy veggies, and GOAT CHEESE. If you are not a goat cheese fan, make this quiche as written and please let me know when you’ve changed your mind. (Kelly, I’m looking at you. 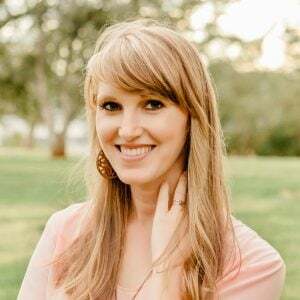 My friend Kelly once told me all the things that she thought goat cheese smelled like, and I haven’t spoken to her since. Just kidding. But seriously Kelly. Jump on the goat cheese train.) I live for this stuff. You have to be careful to clean leeks very well. Run them under cold water, bending the outer layers back to get all the dirt out before slicing. If I were making this again I would chop them even finer than this. I also love the flavor that the leeks add to this quiche, but if leeks aren’t your thing you can totally substitute green onions. Or regular onions. Honestly, quiche is pretty adaptable. Go crazy! I love using Almondmilk in this recipe instead of the typical cream or half and half called for in quiche. I didn’t notice a difference at all, and it’s way fewer calories! This would be perfect to make next week for Mother’s Day, if you are hosting brunch! If you make this, let me know! Use #TheFoodCharlatan on Instagram so I can see it! 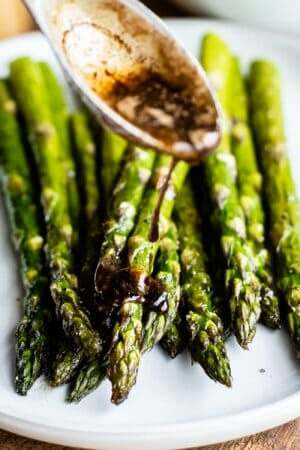 Preheat your oven to 375 degrees F. Use nonstick spray or butter to grease your pan. Arrange the pie crust into a quiche pan or 9 inch pie pan. Trim the edges if necessary. Sprinkle cheddar cheese on the bottom of the crust. Trim the green parts of the leek, as well as the roots. Spilt the leek lengthwise. Run under cold water, using your fingers to bend back the layers. Leeks are super dirty, so do a good job. Save half of the leek for something else (top a pizza! Throw in soup!) 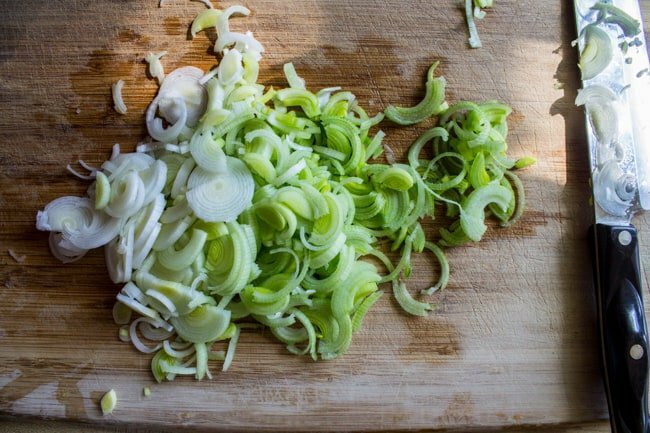 Use a sharp knife to chop one half of the leek, make the pieces about the size you would chop an onion. Sprinkle the chopped leek over the cheese. Use your hand to squeeze the thawed out spinach. Try to get out as much moisture as you can. Spread the chopped spinach over the leeks. Sprinkle 1/4 cup fresh basil next. Crumble the goat cheese using a fork. Sprinkle over the basil. Use a serrated knife to halve most of the cherry tomatoes. Fit as many as you can on top of the quiche. I used maybe all but 10. In a large bowl or stand mixer, beat together 6 eggs, Almondmilk, salt, and pepper. Beat for about 1 minute, then pour over the quiche. If your quiche pan separates, or if your quiche looks very full, make sure you place the dish on a baking sheet just in case it leaks or overflows. Bake at 375 for 40-50 minutes, or until the top has started to brown and the quiche doesn't wiggle when you shake it. Remove from the oven and let cool a few minutes before diving in. Garnish with fresh basil and enjoy! *If you are not a leek fan you can substitute 1 bunch green onions, chopped. This post is sponsored by Blue Diamond Almond Breeze Almondmilk. Thanks for supporting the amazing brands that keep this blog going! 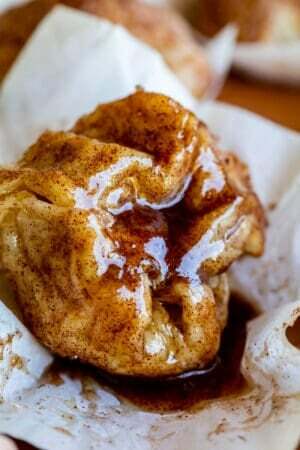 You will love these other savory breakfast ideas! 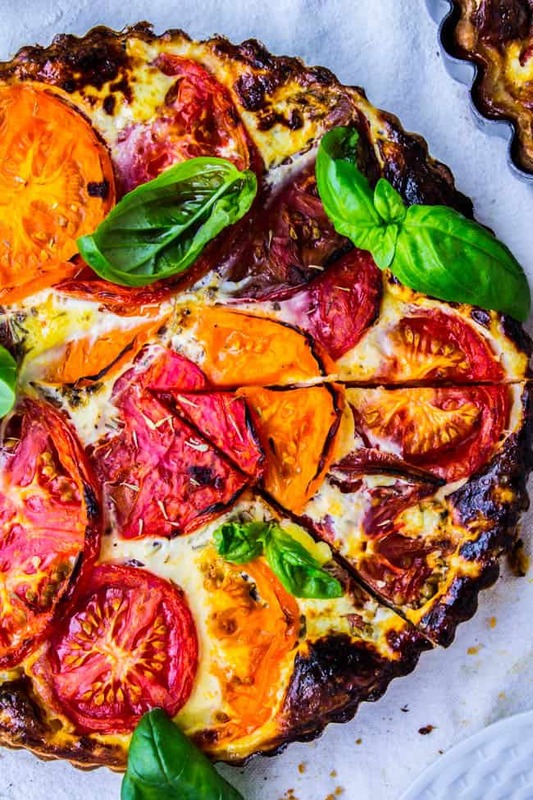 Tomato Tart with Blue Cheese << this one is sooo good with fresh heirloom tomatoes! 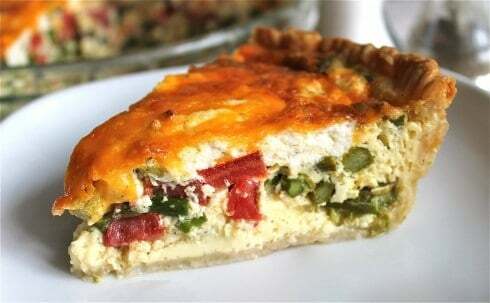 Asparagus, Tomato, and Goat Cheese Quiche << today’s recipe is based on this one. It’s a favorite. I can’t stop messing with recipes I love this much, hence today’s version! 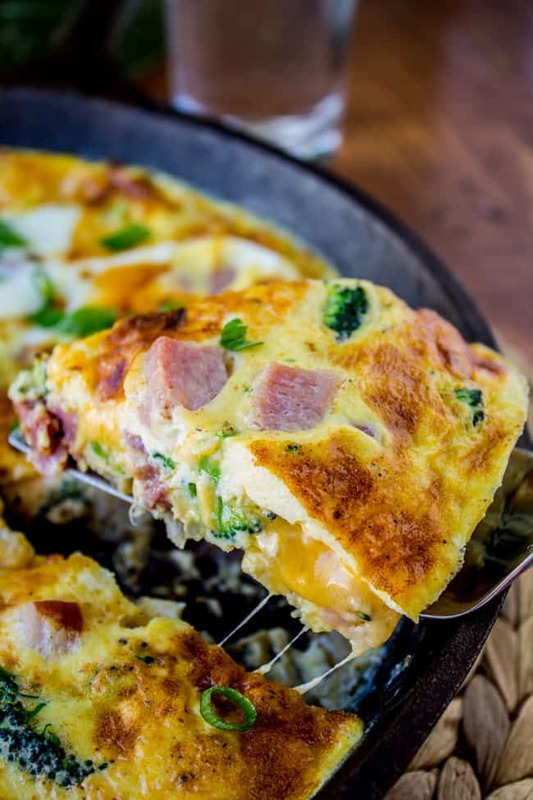 Cheesy Ham and Broccoli Frittata << you won’t miss the crust. Trust me! More quiche recipes from friends! Do you normally bake your crust for 10 mins prior to filling or do you bake raw? My father in law is a chef and always tells me to bake it prior but it doesn’t seem that you do this step in your recipe. Hey Erika, I don’t pre-bake the crust because I’m lazy and I think it tastes great as-is! If you want a super crispy bottom crust, pre bake. Great question! 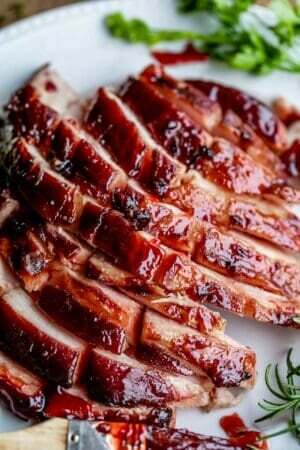 I would love to try this, but the recipe doesn’t come up in the link. Has it been removed? Can I prepare this the night before and bake in morning? I haven’t tried that Ruth! I imagine it would work, although I would worry that the crust would get soggy. Let me know how it goes! This quiche is beautiful! I want to make it for brunch for a couple of friends tomorrow. Could I use fresh spinach? I know the frozen adds a little more moisture than the fresh but I prefer to use fresh. What do you think? This looks amazing and I LOVE leeks! I’m excited to make it but have a pretty strong aversion to basil. Do you know of anything that might be a good substitute? Hey Lorraine! If you don’t love basil you could just leave it out, or replace with spinach. Or you could try another herb you like, like some fresh thyme or something would be good. Let me know how it goes! What could I substitute the sharp cheddar with? 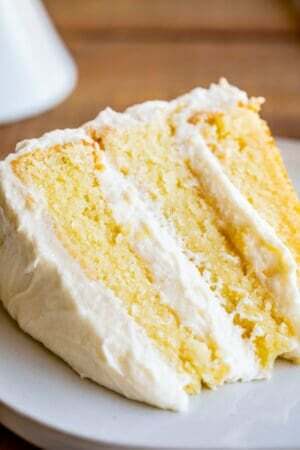 I’m planning to make it sometime, but it’s hard to find that here! Thank you Eloisa! Now I’m wondering where you are from that you can’t find sharp cheddar. I lived in Peru one summer and they didn’t have any there. My mom sent me a 2 pound block in the mail (seriously) so that I didn’t have withdrawals. haha! Really though you could substitute any cheese that you like. Something simple like mozzarella would be good, or something more exciting like gouda would be good too! It’s quiche, and you can’t really go wrong with cheese in quiche. :) Enjoy! I made this for dinner tonight (and breakfast tomorrow!). My boyfriend LOVED it, even though he was tentative about the almond milk. Delicious, thank you. That is the best part about quiche, right?? Dinner tonight, breakfast tomorrow :) So glad you both liked it Abbie! I used to be one of those anti-goat cheese people and I’ve totally converted in the past year! 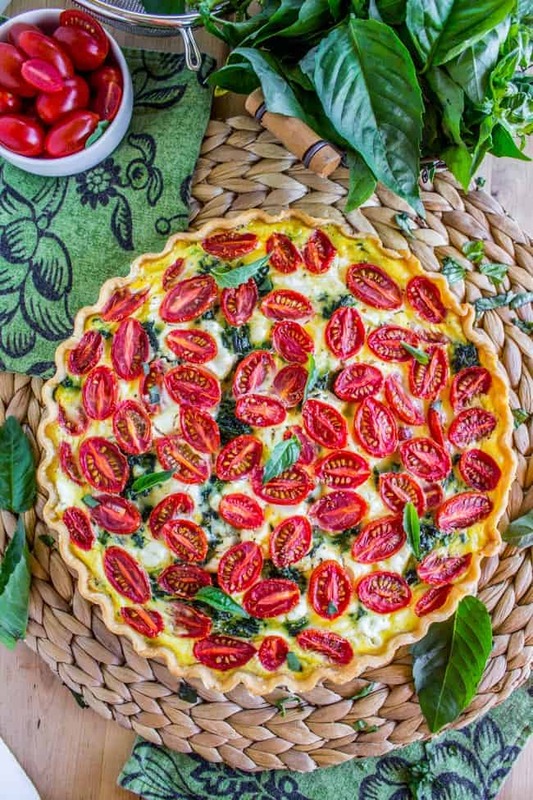 LOVE the looks of this quiche, those cherry tomatoes are gorgeous! Delicious. It was my first quiche and my hubby and I loved it… so healthy, easy, and good. Hooray! I’m so happy you tried it out and loved it Sarah. Thanks so much for coming back to leave a review! Have a great weekend! I could eat this quiche for any meal. It looks perfect. I love all of those tomatoes. And I really like that you used almond milk to cut the calories. Thanks Amanda! I’m with you, quiche for breakfast lunch and dinner please :) I was so pleased with how well this quiche worked with almond milk! I will be doing it from now on! Haha! I knew you would be able to relate Malinda, we should definitely get them together :) And thank you! I have never seen such a beautiful quiche in my whole life! I rarely use leeks, but this eggy plate looks like just the place for them. Thanks Annie! I have to say I’m not a huge leek buyer myself. I like them, I just never think to use them. But they are so good! If I’m using a refrigerated crust, do I cook the crust first? Hey Marcie! Nope, no pre cooking necessary. 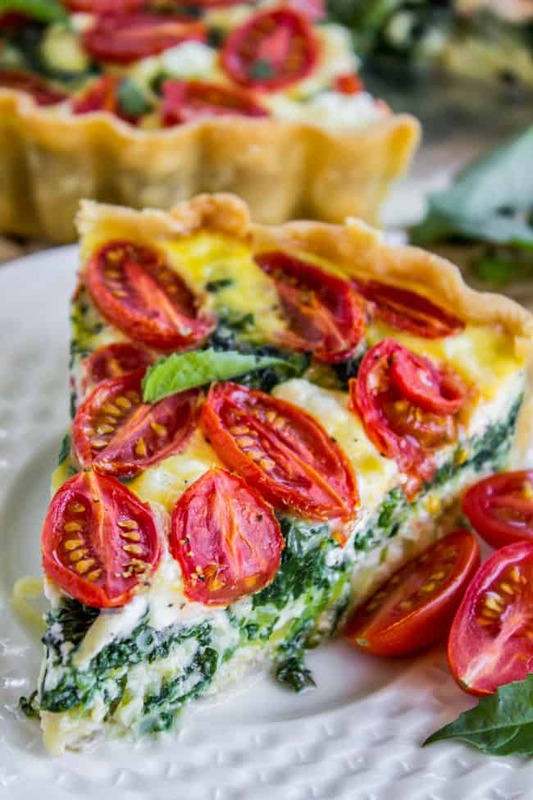 I used a refrigerated pie crust too, shhhhh…..
haha I’m not even a mom and I find it funny too :) This quiche sounds fantastic! I am alll about the tomatoes now that they are starting to get good again! I know! In season tomatoes and NOT in season tomatoes. HUGE difference. I love summer!! 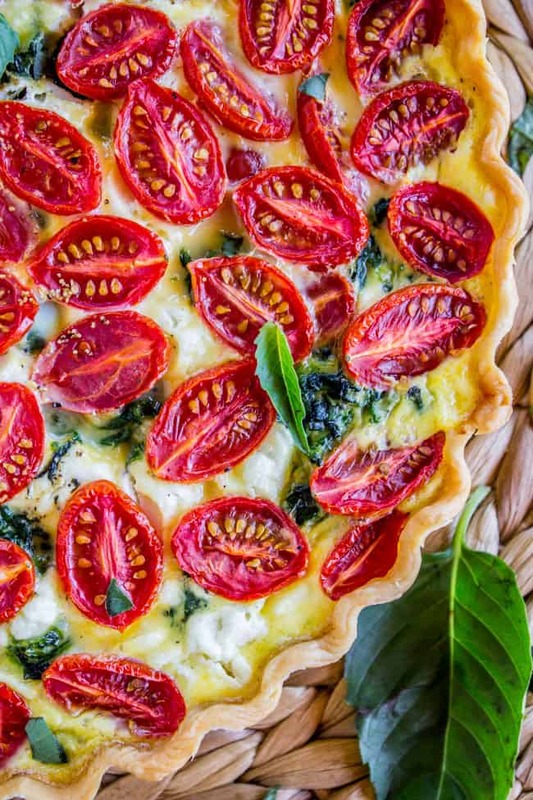 This quiche looks amazing! 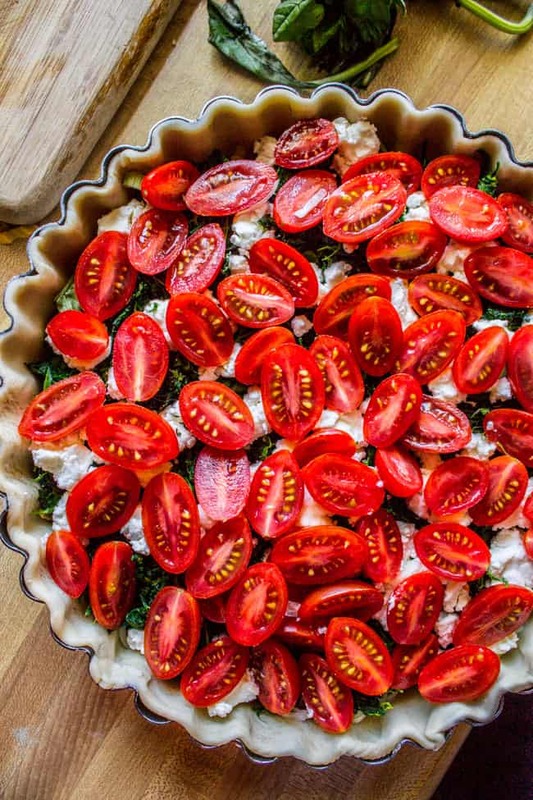 I’m loving those cherry tomatoes on top :) Pinning! Hey Cindy! I’ve never tried it but I can’t see why it wouldn’t work! At the bottom of this post is a link to a friend’s recipe for crustless quiche. Why don’t you check out that recipe and see if you get any tips for how to do a crustless version? It’s obviously a thing, even though I’ve never tried it. Good luck, let me know how it goes! What a gorgeous Mother’s Day treat. I love how you turned all the tomatoes facing up. What a lovely touch!